Railroad Construction Services Overview | RoadSafe Traffic Systems, Inc.
RoadSafe’s Industrial Services Group works on some of the nation’s most complex railway projects with a proven record for safety, reliability and cost effectiveness. We understand the unique nature of railway construction and maintenance operations and the time constraints you face. Only RoadSafe can mobilize expert crews and vast equipment resources with a one-of-a-kind communications strategy to service a single customer. And it’s all available around the clock every day of the year. We’ve partnered with some of the largest railroad companies to help them save time and money while exceeding safety expectations. 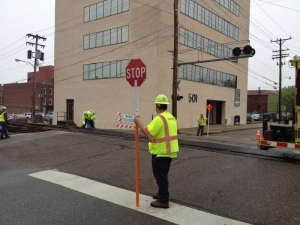 RoadSafe will provide flagging, right-of-way permitting, off-duty law enforcement, cash bond posting and Engineers’ stamps of approval, along with coordination and pre-crossing closing conferences. We also offer complete traffic planning and drawings for short term and long-range projects. All crews are E-RAILSAFE Certified and Roadsafe is an E-Verify employer. For more information, please download our Railroad Products and Services Selection Guide.